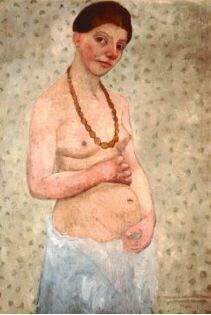 Paula Becker was born in Dresden in 1876 and spent much of her childhood in Bremen. Though her comfortable, middle-class parents encouraged a superficial involvement in all the arts, it is unlikely that Paula ever saw any "real" art until she attended an 1895 exhibition of the Worpswede painters at the Bremen Kunsthalle. Perhaps this accounts for the lasting impression that these artists, members of a Barbizon-like, back-to-nature colony, made on her. In the summer of 1897, after several years of art lessons at home and in Berlin, she decided to spend a few weeks studying in Worpswede, which was located some fifteen miles from Bremen. The following year, she returned to settle there permanently. The Worpswede painters advocated a romanticized view of country life, which they considered an antidote to the horrors of urban industrialization. Paula responded most deeply to the notion that a basically realistic subject could embody profound spiritual values, but she rejected the sentimental approach of her colleagues. Furthermore, she was drawn to the excitement of the city, and, after over a year of fruitful work in her rural retreat, she decided to go to Paris. She chose December 31, 1899, as her departure date, leaving Germany in the old century and arriving in the great city, both literally and symbolically, in the new one. On what would be the first of four trips to the French capital, Paula enrolled at the Académie Colarossi and was kept busy attempting to absorb a myriad of unfamiliar influences. French art, she soon recognized, had great lessons to impart, but it would take her the rest of her life to learn them. A flesh-and-blood romance soon interrupted her incipient love-affair with Paris. Having returned to Worpswede for the summer of 1900, she lingered there in order to be near her fiancée, Otto Modersohn. Both Otto and Paula considered their union to be artistic, as well as physical in nature. After their wedding in May 1901, Paula was not expected to forsake her art for more prosaic "wifely" duties. So long as her painting remained subordinate to her husband's, the marriage went well. However, after a year of painting practically hand-in-hand with Otto, Paula longed to expand her horizons. Much as she loved him, she had outgrown his example and needed, also, to grow beyond the compass of Worpswede. In 1903, Paula returned to Paris for several months, leaving Otto behind, and in 1905, she went again. With each parting, the strain between them grew greater, and finally in 1906, she left him (she thought) for good. In so many ways, her husband had come between her and artistic fulfillment--by being too tame in his work and, consequently, criticizing her own, more ambitious efforts, by maintaining his steadfast loyalty to the German countryside and avoiding any meaningful effort to join the larger world. Above all, however, and by her own admission, the problem was Paula's, for she was monomaniacal in her passions and realized, gradually, that she could give her whole heart only to her art. Paula had less than a full year of tentative, anxiety-laden freedom in Paris. She remained financially dependent on Otto and was plagued on all sides by pleas to return to him. Almost no one she knew supported her decision to dissolve the marriage. Toward the end of 1906, she allowed her husband to join her in Paris, and in the spring of 1907, she returned with him to Worpswede, pregnant. Twenty days after giving birth to a daughter, Modersohn-Becker was dead, the victim of a cardiac embolism. In the last two years of her life, Modersohn-Becker made her boldest strides toward establishing her artistic identity. During her 1906 sojourn in Paris, she opened herself completely to the possibilities presented by French art. On previous visits, she had come to terms with certain French formal precepts--simplifying and honing the contours of her drawings to a minimum of expressive line--but had remained timid in her use of color. Now, influenced to some extent by Cézanne, Gauguin and van Gogh, she adopted a brighter palette. This change lent her formal solutions far greater tonal weight, rendering some of her work nearly cubistic. Despite her cubistic tendencies (discernible even in her earlier work), Modersohn-Becker's incorporation of French formal means was always balanced by her Germanic aesthetic ideals. Like the Worpswede artists, she continued to believe that art must function as a conveyor of pure, humanistic values. For this reason, recognizable subject matter was always a requisite correlative to the experience she wanted to convey, rather than just a pretext for visual experimentation. Although she was one of the first artists in any land to promote an all-over, textural treatment of the canvas, her goal was not to demonstrate an aesthetic theory, but to give her work transcendent spiritual presence. Her achievement, like that of Munch or van Gogh, constitutes one of the isolated, idiosyncratic landmarks along the road to early modernism.